Plants perennial. Culms 20-150 cm, erect. Sheaths smooth, reddish; ligules 0.5-0.8 mm, cilia 0.2-0.5 mm; blades 10-15 cm long, 2-7 mm wide, flat or folded, glabrous or pubescent. 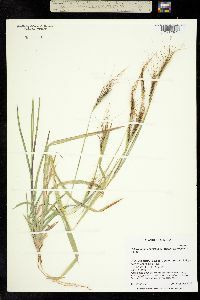 Rames 3-7 cm, secund, with 12-22, brown to reddish-brown, sessile-pedicellate spikelet pairs. Homogamous spikelets 6-10 mm. Heterogamous spikelets: sessile spikelets 5-10 mm, brown, awned; calluses 1.8-2 mm, strigose; awns 6-10 cm; pedicellate spikelets 6-10 mm, unawned; glumes ovate-lanceolate, glabrous or with papillose-based hairs distally, without glandular pits, greenish to purplish-brown, becoming stramineous when dry. 2n = 40, 50, 60. 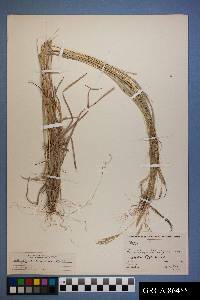 Heteropogon contortus is a valuable forage grass if continuously grazed so as to prevent the calluses from developing. It is also considered a weed, being able to establish itself in newly disturbed and poor soils. Perennials, Terrestrial, not aquatic, Stems nodes swollen or brittle, Stems erect or ascending, Stems caespitose, tufted, or clustered, Stems terete, round in cross section, or polygonal, Plants aromatic or malodorous, Stem internodes hollow, Stems with inflorescence less than 1 m tall, Stems, culms, or scapes exceeding basal leaves, Leaves mostly cauline, Leaves conspicuously 2-ranked, distichous, Leaves sheathing at base, Leaf sheath mostly open, or loose, Leaf sheath smooth, glabrous, Leaf sheath or blade keeled, Leaf sheath and blade differentiated, Leaf blades linear, Leaf blades 2-10 mm wide, Leaf blades mostly flat, Leaf blades mostly glabrous, Ligule present, Ligule a fringed, ciliate, or lobed membrane, Ligule a fringe of hairs, Inflorescence terminal, Inflorescence a dense slender spike-like panicle or raceme, branches contracted, Inflorescence solitary, with 1 spike, fascicle, glomerule, head, or cluster per stem or culm, Inflorescence single raceme, fascicle or spike, Inflorescence branches 1-sided, Flowers bisexual, Flowers unisexual, Spikelets pedicellate, Spikelets sessile or subsessile, Spikelets dorsally compressed or terete, Inflorescence or spikelets partially hidden in leaf sheaths, subtended by spatheole, Spikelet less than 3 mm wide, Spikelets with 2 florets, Spikelets paired at rachis nodes, Spikelets in paired units, 1 sessile, 1 pedicellate, Pedicellate spikelet rudimentary or absent, usually sterile, Spikelets bisexual, Spikelets unis exual, Spikelets disarticulating below the glumes, Spikelets disarticulating beneath or between the florets, Spikelets conspicuously hairy , Rachilla or pedicel glabrous, Glumes present, empty bracts, Glumes 2 clearly present, Glumes equal or subequal, Glumes equal to or longer than adjacent lemma, Glume surface hairy, villous or pilose, Glumes 8-15 nerved, Lemmas thin, chartaceous, hyaline, cartilaginous, or membranous, Lemma 3 nerved, Lemma apex acute or acuminate, Lemma distinctly awned, more than 2-3 mm, Lemma with 1 awn, Lemma awn 2-4 cm long or longer, Lemma awned from tip, Lemma awn twisted, spirally coiled at base, like a corkscrew, Lemma awn once geniculate, bent once, Lemma margins thin, lying flat, Lemma straight, Callus or base of lemma evidently hairy, Callus hairs shorter than lemma, Stamens 3, Styles 2-fid, deeply 2-branched, Stigmas 2, Fruit - caryopsis, Caryopsis ellipsoid, longitudinally grooved, hilum long-linear.